I’m watching Dr. Drew’s show from last night and there’s a lot of discussion on which came first, the gunshot wound or the knife wounds. Of course this is a very important point. But why is no one talking about the question of, if she did use the gun first, why not just keep shooting him? Did the gun only have one bullet in it, and if so, that in itself would be ridiculous (after all, she went to Walmart for crying out loud, and could’ve bought some there if needed). And surely even Jodi isn’t stupid enough to only have one bullet, given all the planning and trouble she went through to get to Mesa and kill Travis. So for the sake of this particular argument, let’s assume there were several bullets in the gun. The answer is fairly obvious – but despite all of the enormously vile sickery we’ve been exposed to over the course of this trial, maybe we’re just not quite ready yet to go there. But I’m gonna go there. The reason she didn’t just kill him by shooting him, however many shots that may have taken, was because the knife created more pain, more terror, more grisly wounds, and overall, involved more cruelty, which she delighted in. It took more of her time and energy to kill him with a knife than it would have to kill him with a gun, and it allowed her to revel in, savor, and indulge in the killing. It took a lot of strength and endurance to create that many stab wounds, many of them deep, in such a short period of time. Using the knife was satisfying, and it met her needs to butcher him viciously. That’s what Jodi Arias wanted – the sweet, sweet pleasure of stabbing him in the heart, literally and figuratively, over and over and over….as many times as she had to, and as many times as she could. Notice most of the stab wounds on his back are centered, as are most on his front torso, aka in the heart area, including the 3-4″ deep stab wound very close to his heart. The photo that shows him holding his hands over his heart was ‘directed’ by Jodi-The-Murdering-Photographer, and was for her sick pleasure. She told him to hold his hands over his heart just before she stuck the knife in. Desperately trying to escape, by the time Travis made it to the bedroom area Jodi realized she had to end it because he was too close to making it out, so she slit his throat. She let him get that far because she wanted to prolong the agony she was causing him, stabbing him all along the way down the hall, because it was incredibly satisfying for her. This is partly why she appears so happy-go-lucky and unburdened in those crazy TV interviews – committing the murder so viciously was like taking a massive weight off her back. And then she shot him in the head just for good measure. Once she got all her needs met (i.e., stabstabstabstabslitstabstabslitstabstab, etc. ), she simply shot him once to make sure he was dead. The gunshot wound is non-personal, and was likely emotionally unimportant for her. All of the stab wounds are very, very personal. Some would say “intimate”, even. If you’re not already following it, I have to recommend tamaratattles.com if you’re at all interested in the Jodi Arias trial. Not only are her posts great, but some of the funniest, smartest, and all-round entertaining comments can be found there! I love it when I come across things like this…these folks make me enjoy humanity for a while. And that’s not an easy thing to do. Below is a conversation I’ve been having on twitter…I avoided explaining that the evil lifeblood of twitter is that (other than celebs & others who use it to promote themselves & make money) many people use it as a tool to “explore”, shall we say, their pent up aggressions and frustrations in a fairly anonymous manner, without having to face real consequences. Why did I avoid it? Because this woman seems like a nice person and there’s no point in making her feel even more animosity towards tweeps. For example, I used to tweet almost solely about politics through a different account, and politics-on-twitter is the epitome of social media hate, vitriol, viciousness, take-my-side-or-I’ll-tell-my-3000-followers-to-block/attack-you-mercilessly, boundless bullying, death threats, stalking, and general out of control scumbaggery. It’s the nature of the beast – don’t enter that den unless you can take being ripped to shreds – or perhaps worse, watching others being ripped to shreds, sometimes for months, as they’re ganged up on by dozens of people who were supposedly their “friends” just last week, or the previous day, or the previous hour. And it never ends because politics never ends. It’s not like a trial that ends, or celebrity scandals that blow over, etc. It is INSANITY. So I guess I’ve seen (and occasionally been somewhat involved in) some of the worst that twitter has to offer. From taking a brief look at this woman’s twitter stream, she just discovered twitter last year…she’s still discussing things thoughtfully and rationally. Yay! I’m happy to have a dialogue with someone like that on a topic we may be in disagreement on. It’s refreshing and – omigawd, as I was typing, some words came outta my fingers that actually made some sense. So I’m sharing here…. The point I made at the end is what this post is about. Not only is an expert witness fair game, but especially when that expert witness is being paid by the state’s tax payers. Even though my tax dollars aren’t paying for the witnesses in the Jodi Arias case, or the defense team of #Jirk, I was born in Arizona and lived there for more than half my life so although I’d have the same opinion in regard to any state, Arizona’s a little closer to my heart. 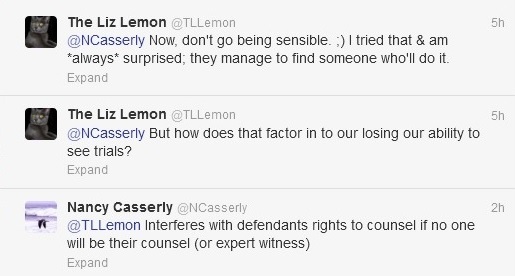 Rather than scaring all potential defense attorneys and expert witnesses away, as @NCasserly believes (I don’t think this country will ever run out of attorneys and experts who will sell their moth-eaten souls for money), but I think this kind of online uproar over these expert witnesses will have a positive effect. Eventually potential experts will realize they had better be extremely well prepared, and have done their jobs properly and impartially, before coming into the courtroom and testifying. And the defense attorneys will hopefully prepare them better – #Jirk did pretty poorly in that sense, and didn’t seem to have even explained to LaViolence what kinds of Q’s and A’s would be involved in cross. I testified in court once, just briefly, and was only told what the subject matter was, not a peep about cross examination, which by now, most of us know is a very, very different animal than direct. I was shocked when the attorney for the other side posed a question as a statement of fact, and he did it quickly and very smoothly right after asking several “easy” questions. Fortunately, there was only one question like that and it was completely contrary to the truth so my answer came out very naturally and enthusiastically as to the truth. I can’t even imagine what it’d be like in a criminal trial – the attorneys must prepare witnesses for exactly what cross examination consists of, and the witnesses must be very well prepared to face it, confidently. “If you were the person you most wanted to be, who would you be? If you could be doing anything right now, what would you you be doing? If you could change anything in the world, what would it be? If you were completely free to express your most dearly held dreams and visions, how would you do that? If you were wealthy enough to buy anything at all, how would you use and invest that wealth in a meaningful way? If you had the time, the money, the knowledge, the energy and the resources to pursue your highest vision, what would you seek to do? If you were free from all the things that limit you and hold you back, in what direction would you go? Stop for a moment and consider these things. Then consider this: There is no need to wait a single moment longer. You can start now to follow your most compelling passion, to achieve your most treasured dreams. This is a strange post…not something that would ever come from my own thoughts (at least not since I was about 19 years old). I had to link to it here because it’s a little bit haunting at this point. 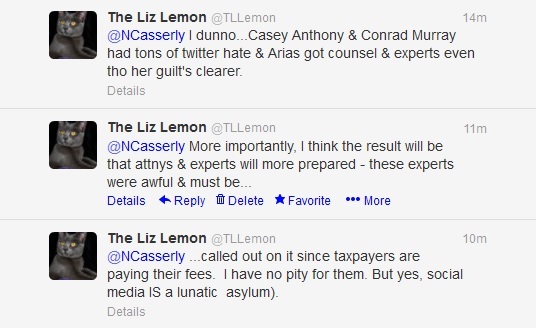 If you’ve been following the Jodi Arias trial, you might get the same feeling I did when I read it. It was posted by Jodi Arias on May 1, 2008, a little over a month before she killed Travis Alexander with shocking brutality, voracity, cruelty, and viciousness. She was a jealous, possessive young woman, and is plagued by personality disorders and sociopathy. That’s my opinion (and not just mine)…. Her trial is still in progress, so of course the jury’s decision is yet to be handed down. From the prosecution’s perspective, this could be taken as part of her crazy thought process as she planned to give Alexander ‘one more chance’ and then kill him con mucho gusto if he didn’t comply with her wishes. The latter option won out on June 4, 2008. I’ve been watching her testimony…she’s a rarity indeed.